It was love at first sight as my eyes met the EOS display stand in Target, whilst on vacation in LA back in April. I had read such great rave reviews online and wanted to see if their products lived up to the hype. I originally picked up the strawberry sorbet lip balm and the berry blossom hand lotion. These became well used during my vacation and after being passed from handbag to handbag, they were no longer in any state to be photographed. Alas, my review had to wait until I could get my hands on some new products to photograph. Friends were going back out to LA last month and totally surprised me upon their return with a bunch of EOS products. I was absolutely thrilled. Not only did I have more goodies, but I could finally write a review on my new love, EOS. 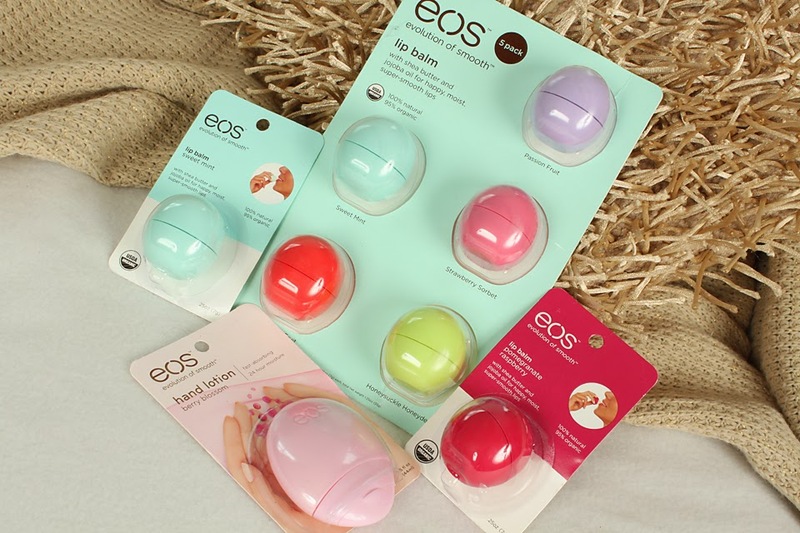 You may be wondering why I'm so obsessed with the EOS products. Lets begin with the lip balm. 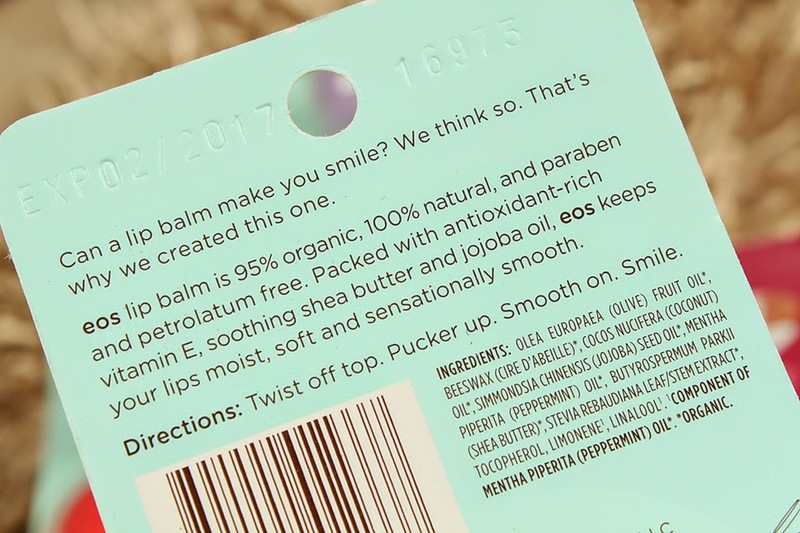 Not only does this lip balm contain 100% natural ingredients, it's also 95% organic. It is extremely smooth to apply, and moisturizes your lips for such a long time. It also contains vitamin E which is known for its many health benefits. The packaging is great. It's small enough to hide in your purse, yet jam packed, giving you a ton of product. I usually struggle on holidays with my lip balms. Either they're difficult to open whilst your hands are greasy from suntan lotion, or they melt. I don't know how many times I've reached for a tube of lip balm for it to fall apart out of the tube whilst on my lips. Alternatively there are the lip balms that need you to jam your fingers into the tub, where you find the underside of your nail full of product. When you do manage to open the tins of certain lip products, to find your product stuck to the lid because it's now a big melted mess. Please tell me i'm not alone with this lip product nightmare? EOS is different. I had this in crazy high temperatures, and it didn't melt at all. I though that I may have had issues with opening the lip balm since it's shaped like a ball, but it was no struggle at all. (There are flat sides so you have something to hold on to as you open it up.) Then there's the flavour, OMG it's devine. 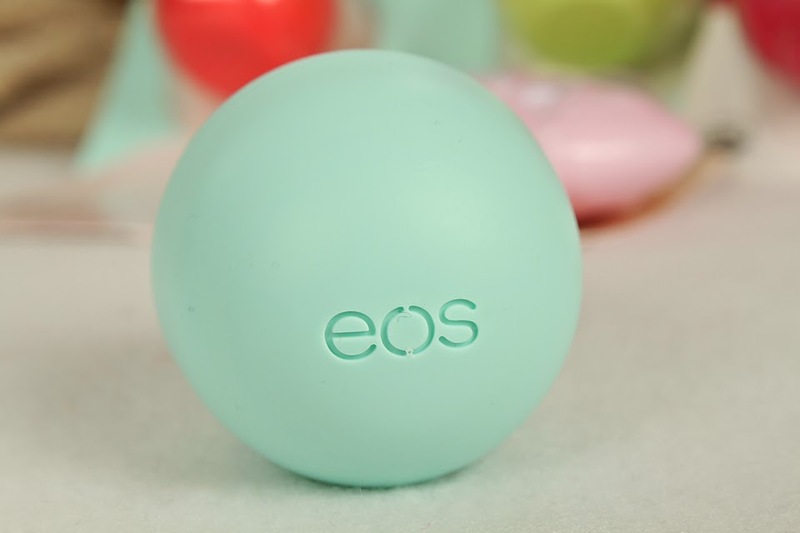 I kept reapplying the eos lip balm when I really didn't need it, simply because I was obsessed with the scent. My lips were silky smooth all holiday. I loved it! 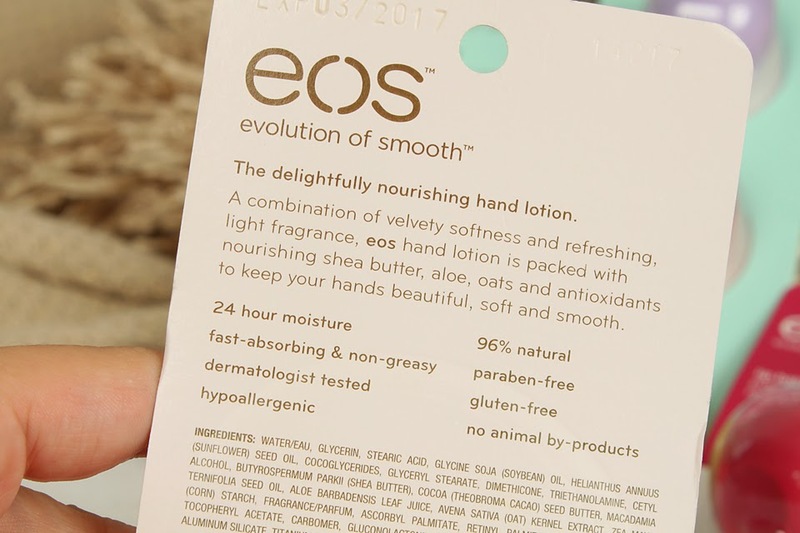 Then there are the EOS nourishing hand lotions. I can't even begin to describe the scent of the berry blossom. I kept receiving compliments over the smell, so naturally I kept applying it. The hand lotion absorbs really quickly, which is a must when it comes to my favourite hand lotions. I hate nothing more than having to wait to touch my bag, or my phone whilst my lotions does it's job. It has a non-greasy formula, which is amazing. I did put this onto my face a couple of times when my skin felt a little dry and it worked wonders. The hand lotion is 96% natural, so not quite as natural as the lip balm but that's totally fine with me. It's paraben-free and gluten-free which I thought was pretty amazing. The packaging is great too. It's thin enough to throw into your purse, and it's super easy to get the lotion out. This one pictured is my second hand lotion and I will definitely be repurchasing when it's time to say goodbye. 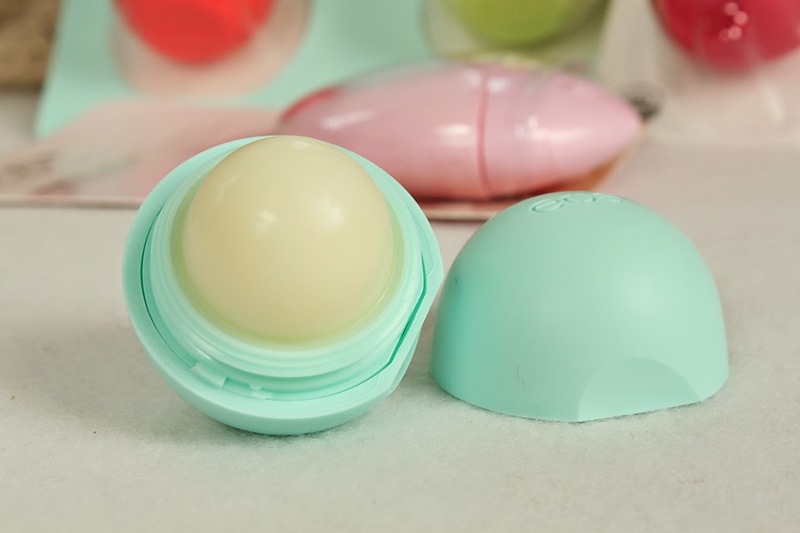 I still haven't tried an EOS balm but I really need to! Lovely post. I love them. I wasn't too sure why people were talking about them so much until I tried them myself and now i'm addicted. Btw you just had my most perfect haul. Love yankee and lush! 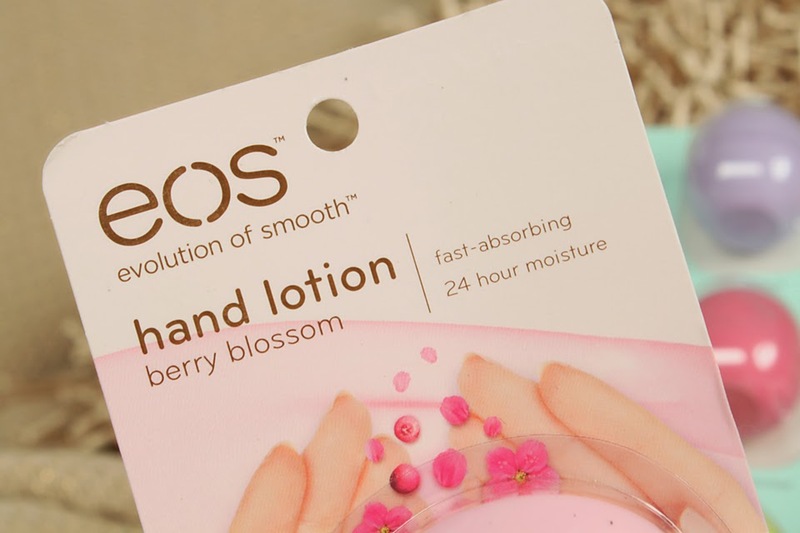 I LOVE the design of the EOS hand lotion... whoever designed it is a genius! lol I use their shaving cream and even the design of their shaving cream bottle is nice! I've tried both the lipbalm and the hand lotion. Their packaging is just so cute! I only like the lip balm sometimes because I feel like it's too thin at other times. But it always sits on my night table because it's so cute!